Wild: Megalania Muruspede is among the largest creatures found throughout the island’s complicated cave networks. Reaching up to three meters long, it can traverse vertically up the cave walls with little difficulty, using its claws as iron-strength grips. Fortunately, Megalania’s size means it is unlikely to sneak up on anyone. Unfortunately for spelunkers, it is an aggressive and dangerous creature nonetheless. Domesticated: The extremely rare ability of Megalania to effortlessly climb walls makes it a highly sought after mount. While it is by no means the fastest, strongest, or toughest mount—the way it can effortlessly climb in the caves and scale mountains means it will always have a place in any advanced tribe’s stables. 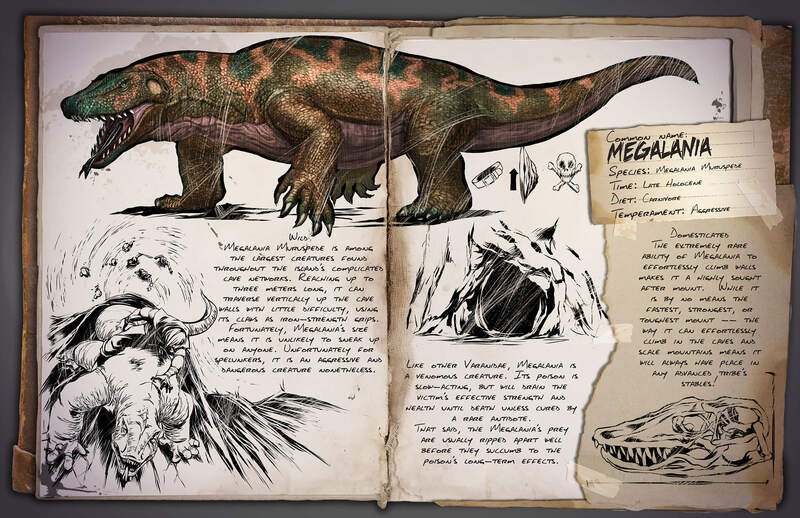 Known Information: Like other Varanidae, Megalania is a venomous creature.. Its poison is slow-acting, but will drain the victim’s effective strength and health until death unless cured by a rare antidote. That said, the Megalania’s prey are usually ripped apart well before they succumb to the poison’s long-term effects.